“When I was there, even the protestors we talked to on the ground… they just want to be filmed by the international press so then they can show it (to) the international media to create an international scandal. So they’re quite aware of what the strategy is and they’ve been at it for some time.” – Mike Prysner, from this week’s interview. While the Trump Administration is mobilizing U.S, troops to greet the arrival to the U.S. border of 7000 Central American migrants, Colombia takes in over 4000 Venezuelan migrants daily as a result of the economic crisis plaguing the country. The economic noose has been tightening around the population of the Bolivarian Republic of Venezuela over the last year. The economic sanctions directed at the Maduro government have taken their toll contributing to the plight of ordinary Venezuelans. Efforts to challenge these government narratives have been frustrated. National broadcasts in Canada and the U.S. have been ratcheting up the perception of President Maduro and his ‘dictatorial’ ways as a contributor to the human rights situation now plaguing the Venezuelan citizenry. Most recently, solidarity activists in Canada have been lamenting their failure, as of this date, to bring a Venezuelan Deputy Minister of Foreign Affairs, Carlos Ron Martinez, to Canada. The claim has been made, though not yet verified, that Ottawa is deliberately blocking the Minister’s passage to Canada. On this week’s Global Research News Hour radio program, we make an effort to counter the conventional talking points about Venezuela, and get more detail on some of the efforts to change the Canadian government’s stance. 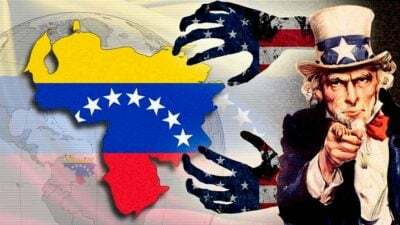 American-based Telesur journalist Mike Prysner has done exhaustive reporting from Venezuela throughout the National Constituency election process and witnessed much of the opposition protests directed against Maduro in the last year. He brings us his perspective in our first half hour. In the second half hour, Toronto based organizer Barry Weisleder joins us to share his thoughts about the Trudeau government’s hostility toward the Bolivarian Republic and some of the challenges, including the above mentioned setback, faced by Canadian solidarity activists. Finally, we hear part of a speech given to a Winnipeg audience (via skype) by Venezuelan Deputy Minister Carlos Ron Martinez about the situation in Venezuela, and how they are coping. Los Angeles based Mike Prysner is an Iraq War veteran turned anti-war activist. He has co-produced the Empire Files with noted journalist Abby Martin. He also produces the Eyes Left podcast. Barry Weisleder is a retired teacher and union organizer and the federal secretary of Socialist action. Carlos Ron Martinez is the Vice Minister of Foreign Affairs for North America. He had previously served in Washington D.C. as the Chief of Venezuelan business affairs in the United States. Plans to host talks by the Minister in several Canadian cities were derailed following indefinite delays in securing a visitor’s visa.